Here and There: Who are these people? Just kidding, I know who they are. 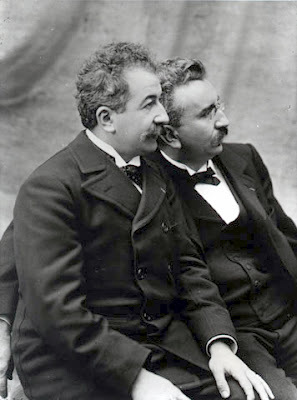 I went to the Insitut Lumiere yesterday, which is a museum telling all about these two men above (the Lumiere brothers) and their advances in early moving pictures. If I understood correctly (everything was in French there....) they made the first film EVER, and I think it was of workers leaving a factory? Don't take that as fact though, cause I could've misunderstood. Anyway, the museum was really interesting, and they actually had many, many other inventions (they seemed to be quite the geniuses...) like the autochrome, which is what the first picture is. They chemically added color to photographs, and until the 1930's that was the only form of color photography. 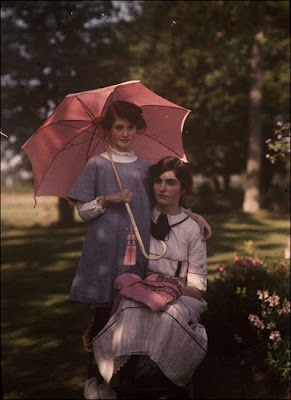 Evidently the movie The Illusionist tried to create the look of an autochrome. What was most interesting to me though was that they traveled all over the word recording different cultures, so seeing Mexico, Africa, and Morocco so long ago was just really...crazy. Anyways after going there I went to some friends of Janine's apartment for dinner with a bunch of people, and it was fun. Nice people. It was also nice to hear English again after listening to French alllll day. Anyways, not sure what's on the plate for today, but tonight my roommate Sarah is having a going away dinner with her friends at a Creperie (a place with crepes...) and then drinks . Should be fun. The only annoying thing here is that the buses and metro end at midnight and 1am, and since I live in Tassin, which is considered a suburb, there is no other way to get home unless we want to pay a lot for a taxi. Or if we want to walked for 1.5h....no thanks. Anyways, a bientot!